12.5%- protein, holding ration for maintaining breeders in the non-production season and mature game birds that are not to be used for shooting preserve. Balanced levels of amino acids and salt designed to address cannibalism. 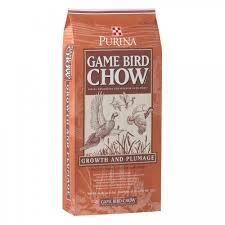 Purina® Game Bird Maintenance Chow is offered in a crumble or pellet feed form. This product is NOT intended for use where growth or production are major goals. Plenty of clean, fresh water should be available to the birds at all rimes. A feeding program is only as effective at the management practices followed.